The Finley Bed in Beige is a contemporary take on the classic English wingback beds. 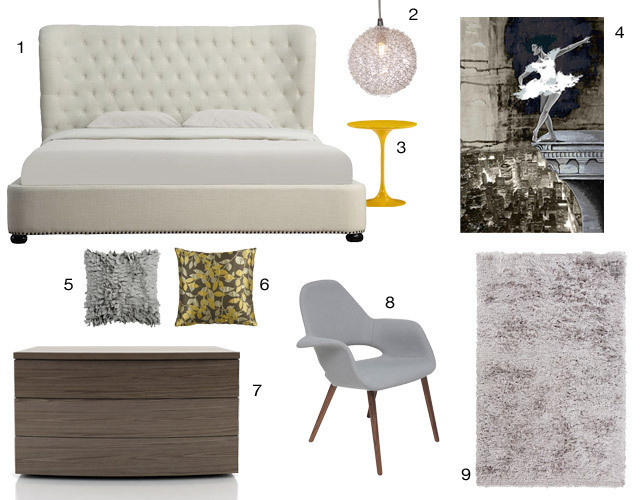 With its beige linen upholstery and large tufted headboard, our buyers thought it tied in well with natural wood tones, subdued accent pieces, and bursts of yellow. Tying everything together really began with the artwork; in this case, the canvas print Big City of Dreams. The canvas casts together white, grays, and hints of golden yellow - just enough to compliment the striking Wilco Side Table and Cypress Pillow. Texture was added throughout with the gray shag rug and Delano Pillow. And, of course, no bedroom is complete without a place for your dubs and a small accent chair!